He gave an interview about his total disappointment. Bettis adds to change the culture around the Steelers organization; everyone has to be on board and that there can no longer be special treatment for certain players. ing acknowledges that the AB situation needs to be resolved before the Tomlin extension can be discussed. So with all of this drama...is the national perspective of the Steelers that it's a circus? Bettis. Rocky Bleier. Bradshaw. Even the FFPK. All in agreement. Short of a change at HC, we're screwed. Its an unfortunate paradox. Through its unwavering value of stability, the organization goes deeper into chaos. So you listened to that and think you hear Bettis saying there needs to be a change at head coach?! Maybe it should first be established that any poster in the thread in fact infers from the interview what you laugh at? He's right. Culture HAS to change. My question is after 11 years, how does Tomlin credibly come into 2019 and change the culture with the players actually taking him seriously? This is why companies hire outside the organization for leadership when they want to change the culture. Tomlin has certainly allowed this to become messy, but no one with credibility, nowhere has implied a loss of respect from his players. The culture is still in a place where it can be fixed, but it becomes much harder to do if they keep AB. 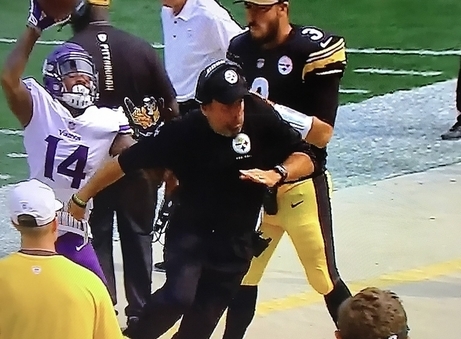 It seems like Tomlin has less “Head football coach” respect, and more “dude is always up for a game of Madden” respect. But that’s just my inference based on all of the locker room transgressions. Its hard to change the way you’re perceived by the people that work for you. Rooney has also allowed this. He could have killed this noise long ago. When Art Rooney II indicated that he wanted to prolong the career of Roethlisberger after he saw him getting killed, he took steps to get it done by getting rid of Arians and bringing in Haley and eventually Munchak. He should've taken steps to clean up this mess also before it got this big. The PG Headline was hysterical. “Jerome Bettis Blames Everyone for Steelers’ Drama”. That's what he said. But they gotta sell the drama....... that was a 90s huge hit. I'm all for Tomlin being replaced unless drastic changes are made but I am terrified at the idea of Art II heading up a head coach search committee. Hines nails it. The Steelers are the bengals of the early 2000's, ocho cinco, tj whos-your-mama.... NAILED IT! Said that many times over the past year. Tomlin is basically Marvin Lewis, but with a HOF QB. And like CIN, we're going to hang on to him far too long. To be completely honest, I don't think Tomlin brings near as much to the table as Marvin Lewis. I’m amazed he didn’t have his name taped to his forehead. I know. If he brings in another Tomlin-like HC, we're screwed for another 10+ seasons. Irony?! Yeah, it's not any coincidence Brown's mentor's include Owens and Johnson. Ward Nailed It!